Lapis Lazuli and Silver Llama Cocktail Ring from Peru, "Andean Llama"
With a torso of natural blue lapis lazuli, a charming llama from the Andean highlands is featured in this Peruvian cocktail ring. Designed by Bertha Vera, the ring is crafted of 950 silver. 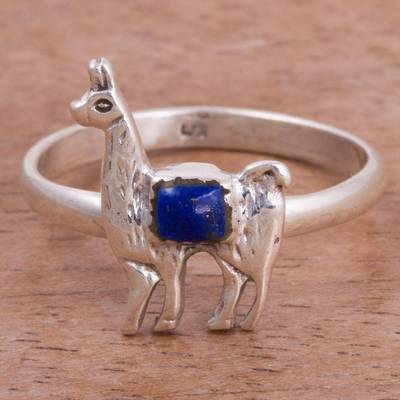 You can find lapis lazuli cocktail ring 'Andean Llama' by Bertha Vera in jewelry categories such as Animal Themed Rings, Birthstone Rings, Lapis Lazuli Rings, Silver Rings, Fine Silver Rings and Cocktail Rings. Enjoy exploring these sections for other Novica treasures.